In 2014 OnePlus was a company that was basically unheard of. Despite that, there was great anticipation in the Android enthusiast community about a new smartphone coming from this new company. Their first smartphone ended up being called the OnePlus One, and it was arguably the first device in a trend of smartphones that tried to bring flagship specifications to devices with prices much lower than what the big players in the smartphone market demanded for their best smartphones. The OnePlus One certainly wasn't perfect, but it showed that it was possible to produce a high spec smartphone for hundreds of dollars less than Android flagships, and what OnePlus needed to improve on was their execution. A year came and went, and OnePlus came out with the OnePlus 2. This was during a time where the Android market was still struggling to deal with the issues posed by Qualcomm's Snapdragon 808 and 810 SoCs, which put Android performance improvements at something of a standstill. In the case of the OnePlus 2, I discovered that OnePlus had put mechanisms in place that reduced web performance even further, and as I reviewed the OnePlus 2 I discovered concerning regressions in other aspects like the phone's display, and its battery life. Moving into 2016, we now have the OnePlus 3. At this point OnePlus now has a better variety of hardware to choose from, and they should know exactly what to fix from the OnePlus 2 to make a great smartphone. However, the smartphone market gets more competitive with each year that passes, and it's no longer enough to simply put good specs in a device and fail with the execution. Finding out how well OnePlus executed with the user experience is what I'm here to tell you, but before getting in to that, it's important to see how the OnePlus 3 compares to its predecessor. At least at a high level, the OnePlus 3 shows a great deal of promise. The move from Snapdragon 810 to 820 will certainly improve performance, especially when you consider the app detection that OnePlus was doing which crippled web performance on the OnePlus 2. There's also a whopping 6GB of RAM. I do wonder if 6GB is overkill only because the number of apps that people actually use on a daily basis may be smaller than the number that 6GB can actually keep resident in memory. It's also worth noting that there is an energy cost to adding more RAM as each memory cell has to be periodically refreshed to maintain data integrity. OnePlus has moved to an AMOLED display with the OnePlus 3. While it was once the case that AMOLED displays that weren't on Samsung devices exhibited low brightness and poor calibration, recent AMOLED devices have reversed that trend entirely. However, moving from a 1080p RGB LCD to a 1080p PenTile AMOLED does come with a reduction in effective resolution, and I'll talk about that more in the display section. With the cameras, OnePlus has gone back to Sony sensors. The front-facing camera moves to 8MP, and the rear-facing goes to 16MP. Lenses stay at f/2.0 which I think is a smart move given some of the problems we've seen regarding sharpness and distortion on phones that have moved to even wider apertures. There's more to the camera story than what you see on paper, and I'll be covering that as well. As for other changes, there's now only one version of the phone which is 6GB of RAM and 64GB of UFS 2.0 storage for $399. I almost never saw the 16GB OnePlus 2 for sale anyway, so this isn't really some sort of pricing upset. As for connectivity, you still have a USB 2.0 based Type-C connector and 802.11ac WiFi, but NFC has made a return which means the OnePlus 3 will be usable with Android Pay and other applications that make use of NFC. One of the big changes OnePlus has made with the OnePlus 3 is the industrial design. Nothing about the OnePlus One's design was really exceptional, but given that it was bringing many flagship specs to a phone that costed several hundred dollars less than flagship phones of the time it was entirely understandable. With the OnePlus 2 the average price of OnePlus's flagship phone went up, but OnePlus had made some changes to the external design. The phone gained a metal frame but retained its sandstone back cover. To be honest, I wasn't really a fan of the OnePlus 2's design. The metal frame didn't do much to improve how high quality the phone felt, and the back cover wasn't coarse enough to really have an impact on how grippy the chassis was. On top of that, the fact that the display layer of the phone had a plastic border that sat above the metal frame looked kind of cheap, and the increased thickness and mass actually represented regressions from the OnePlus One in some respects. 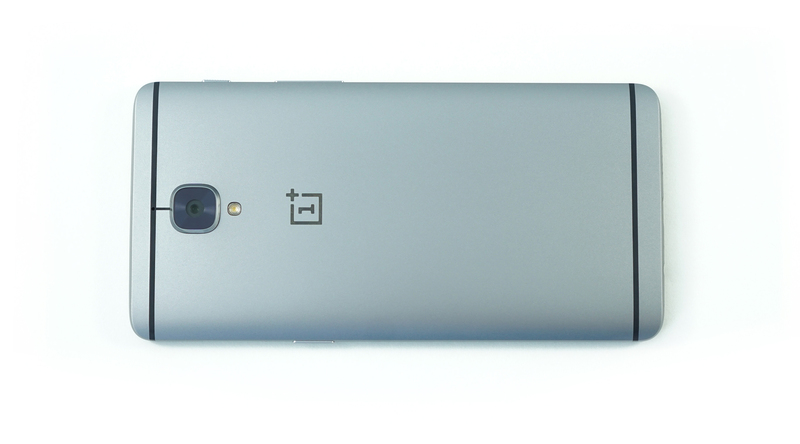 With the OnePlus 3, OnePlus has moved to an aluminum unibody design. In doing so they've addressed pretty much all of my issues with the OnePlus 2. Starting with the back of the device, you no longer have the sandstone finish. I'm sure many people will disagree, but the OnePlus 2 back cover didn't help me with gripping the phone at all. The OnePlus 3 feels like a much higher quality device, particularly because there are no longer three distinct sections of the phone that all have seams and gaps between one another. The unibody design means the back cover is no longer removable, but as I said in my OnePlus 2 review I think the removable back cover on OnePlus devices was a complete waste anyway because it only served as a way to access the SIM slots, which could have been implemented as a tray on the side of the device. With the OnePlus 3 they've done exactly that, and so the removable back cover isn't needed. The back cover sees some additional changes, with some being independent of the move to an aluminum chassis. There are now lines for the antennas on the top and bottom of the phone, and the top line connects to the square-shaped camera sitting beneath it, which reminds me of the HTC One M9. On the topic of the camera, there's no longer a separate island that the camera and flash sit upon, which I think is a big improvement on what I felt was one of the least appealing visual aspects of the previous OnePlus devices. The camera does stick out significantly more than it did on the OnePlus 2 which is just a consequence of the significant reduction in thickness, and OnePlus has actually decreased sensor size with this generation so the hump likely would have been even larger if they hadn't. The only other thing to note about the camera area is that there's now just a single LED flash and the camera uses PDAF, while the OnePlus 2 had a dual LED module and an IR module for the laser autofocus. On the left side of the phone you have the volume rocker and the mute switch, while the right side has the sleep/wake button and the NanoSIM slots. I appreciate that OnePlus has kept their volume rocker on the left side of the phone, and I think the three stage mute switch is an underappreciated feature that more manufacturers should adopt. You can see above that the phone's edges only curve to a point, at which point you have a chamfered edge that meets the display glass. I like the appearance that this provides, but it does mean that you don't have the same smooth feeling when swiping near the edges of the display that you get on a device like the iPhone 6s Plus. The bottom of the phone is changed from the OnePlus 2. There are no longer any antenna lines since they wrap around the left and right sides of the phone, and there aren't holes drilled on both sides of the USB Type-C port which has allowed the 3.5mm audio jack to be brought to the bottom of the phone. One thing that bothers me is how the 3.5mm jack isn't centered like the rest of the ports and screws, which kind of ruins the visual uniformity. You can also see OnePlus's pre-applied screen protector in the image above. It doesn't quite cover the entire display from edge to edge, and I noticed that a great deal of dust was collecting around the edges so I ended up removing it. It's just your typical plastic screen protector rather than a glass one anyway, although the fact that OnePlus throws it in for free is a nice gesture. The front of the phone is similar to the OnePlus 2, but it's clear how the overall shape of the phone has changed to become more curved, while the OnePlus 2 was similar to the Nexus 5 in how it had flat sides meeting curved ones at hard angles. I have to say that I prefer the appearance of the OnePlus 3 in this regard, but it may be seen as less unique than the OnePlus 2. 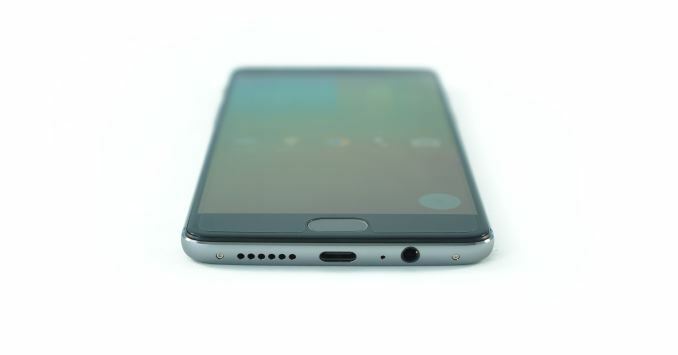 As for what's on the front cover, you have the earpiece and front-facing camera on the top, with three capacitive keys on the bottom. The middle key is the home button, which also acts as a fingerprint scanner in the same manner as the OnePlus 2's home key. In my experience the sensor has been quite accurate and just as quick as anything else on the market, and having it on the front of the device provides a better experience than rear-mounted scanners. OxygenOS provides many ways to customize the phone, so you also have the option to switch the order of the back and recent apps buttons, and if you want software keys OnePlus provides that as an option as well. I covered the major points of OxygenOS in my OnePlus 2 review, and I haven't seen any major changes to it so I'll just refer to that rather than going over the features a second time. The one thing that has changed is that the UI no longer feels unbearably slow and sluggish, and in the next section you'll see exactly why that is. I know I keep saying the same thing each time this comes up, but our smartphone team is four different editors in different parts of the world (West coast, Canada, Europe, Central), and have different schedules (only one is full time). The s7 review is 3 MONTHS late. Tons of other sites have found time to finish reviews, yet anandtech cant? The late GPU reviews as well, are painting a very poor picture. Where are the 1080 and 1070 reviews? Or heck, what about that 960 review that never came out? Or that macbook pro 13 review that was promised and never came out?